Included below are homes for sale in Bird Rock. If you would like more information on any of these Bird Rock real estate listings, just click the "Request More Information" button when viewing the details of that property. We can provide you with disclosures, past sales history, dates and prices of homes recently sold nearby, and more. And, if you haven't already, be sure to register for a free account so that you can receive email alerts whenever new Bird Rock houses come on the market. Bird Rock is a community located in the southwestern corner of La Jolla bordering Tourmaline in Pacific Beach, and the foothills of Soledad Mountain to the east. Bird Rock is named from the large white rock just off the shore in the Pacific Ocean where different marine birds are perched. 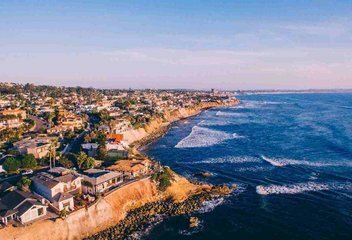 Oceanfronts in Bird Rock La Jolla are located on Dolphin Place, Chelsea Place, Calumet Ave, Sea Ridge Drive, and Chelsea Street. Bird Rock streets are in a gridded street pattern with homes dating back to the 1950s as well as many recent remodels and teardown new construction. Bird Rock is the only beachside community in La Jolla without a sandy swimming beach due to the sandstone cliffs however it is just blocks from famous WindanSea Beach. The merchant district of Bird Rock with world class dining and casual eateries is the heart of the community covering three and a half blocks along La Jolla Boulevard beginning at Midway Avenue to Camino de la Costa. Annual community events include Tour of Bird Rock Homes in January, Beaumont Street 4th of July Parade, Taste of Bird Rock in July, Community Picnic in August, Oktoberfest and Halloween Window Painting in October, and more.